Founder of the Mindful Badge Initiative. 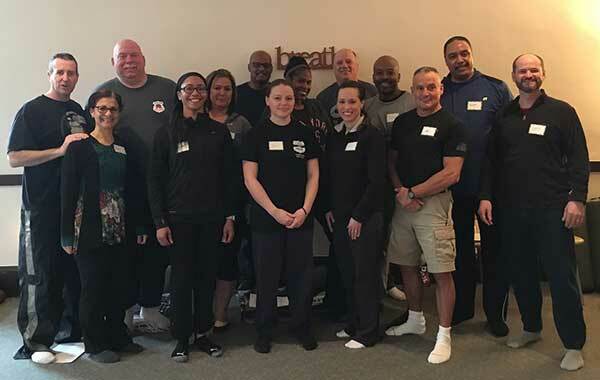 Chris Checkett, founder, at the Cleveland Mindfulness Center offers a Mindfulness and Yoga for Law Enforcement one-day training (5 hrs). This training has been designed using trauma-informed methodology. The Mindfulness and Yoga Training includes: an introduction to mindfulness techniques, physical yoga exercises and a deep relaxation practice. The main aims of the training are stress reduction and resiliency. Follow-up mindfulness and yoga classes are available to enable officers to continue to practice the techniques learned in the training. On-going practice helps officers to achieve maximum benefit from these techniques leading to stress reduction, and increased well-being. Contact Chris to discuss your interest in bringing this training to your agency. Law enforcement officer’s lives are at risk for high blood pressure, insomnia, increased levels of destructive stress hormones, heart problems, shortened life expectancy, post-traumatic stress disorder (PTSD), depression and suicide due to many pressures, including the threat of violence and exposure to trauma that they experience every day on the job.